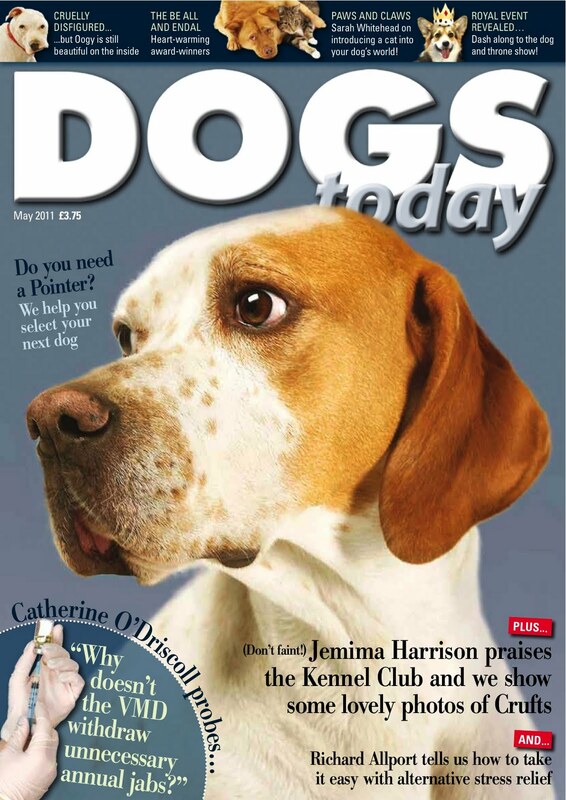 for the May 2011 issue of Dogs Today. How did the Kennel Club come to add the "Parson Russell Terrier" to its roles 100 years after the Reverend John Russell died, and what does this story tell us about the role of all-breed registries in the world of honest working dogs? The Reverend John Russell was born in 1795 and acquired his first white foxing terrier in 1815 from a milkman. Russell’s claim to fame is not that he invented the fox terrier, but that he was “the old man of terrier work” when the Kennel Club was founded in 1873. Like most new organizations, the Kennel Club began on shaky legs, and sought to promote itself by trying to associate itself with big names as quickly as possible. 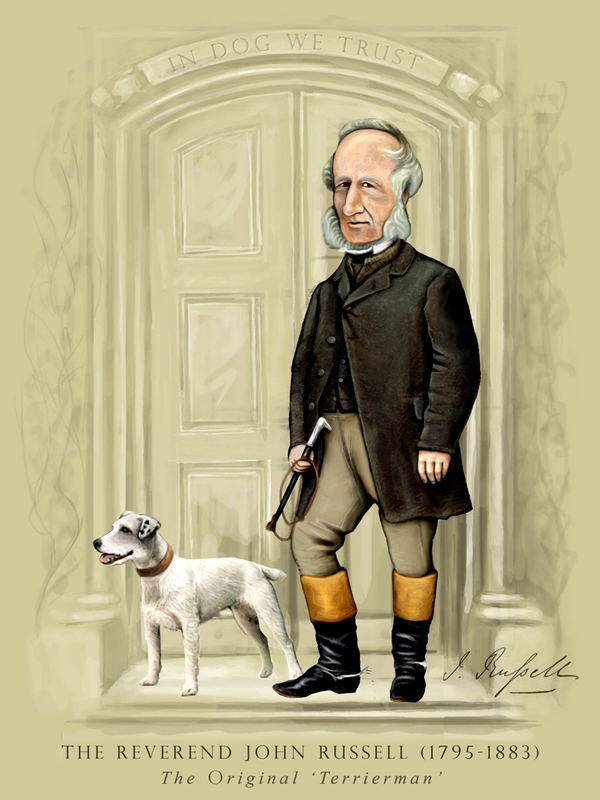 Though John Russell had retired and sold off his hounds a few years earlier, he was still famous, and so he was tapped to judge fox terriers at the Crystal Palace Show of 1874. Apparently, Russell did not much like what he saw, however, for he never agreed to judge a Kennel Club show again, and he refused to let his own dogs be registered. "True terriers…but differing from the present show dogs as the wild eglantine differs from a garden rose." "[Those terriers] best adapted for hard work… are cross-bred, hardy dogs, specially trained for the purpose, although many of the 'pedigree' animals will do similar duty to the best of their ability, but their 'pedigree' and no doubt inbreeding to a certain extent, has made them constitutionally and generally weaker than their less blue-blooded cousins." Bam! The Kennel Club Fox Terrier had ceased to be a working dog in less than 20 years time! Dog dealers selling working terriers at the turn of the Twentieth Century sought to differentiate their working dogs from the non-working and over-large terriers paraded at Kennel Club shows. Advertisements for working dogs no longer called them “fox terriers,” but instead offered up "Jack Russell" terriers, the name Robert Leighton was already calling them in his 1910 book, Dogs and All About Them. By 1930, a survey of over 100 mounted hunts in the U.K. found "Jack Russell" terriers listed, as well as "white hunt terriers" and "Devonshire working terriers". When the term “fox terrier” was used, it was carefully proceeded by the words "cross," "cross bred," "non-pedigree," or even "mongrel". No one was using a pure-bred Kennel Club dog! World War II saw a decline in the mounted hunts, but things roared back in the 1950s, 60s and 70s, as easy access to cars made it easier to get out into the countryside. In 1974, the Jack Russell Terrier Club of Great Britain was founded "to promote and preserve the working terrier known as the Jack Russell." In 1976, its U.S. analog was created -- the Jack Russell Terrier Club of America. Both clubs have prospered and stuck to their original mission, and today the Jack Russell Terrier Club of America remains the largest Jack Russell terrier club in the world. With an increase in the popularity of the Jack Russell terrier, a push was initiated to pull the “old” fox-working terrier into The Kennel Club. In 1990 this goal was finally achieved with representatives from several smaller Jack Russell Clubs meeting to draw up a conformation "standard" that called for a dog standing 12-15 inches at the withers. The new dog was to be called the “Parson Jack Russell Terrier," a name invented special for the occassion. The origin of the new Kennel Club standard is a bit vague. It is said to be adopted from one originally written by Arthur Heinemann, an American-born badger digging man and dog dealer from the 1920s, but no evidence to support this claim has ever been presented. "He always said there was nothing a good fourteen inch terrier could do that a good eleven inch terrier couldn't do better…. Some of his best workers were no more than ten inches." "[I am] very much opposed to the modern show terrier and his type. Once you begin to breed it for show type, you lose the working qualities upon which you pride those terriers. I have been, I might say, the protagonist of the terrier bred for sport as against the terrier bred for show. I have no interest in cup hunting." Russell and Heinemann may not have had any interest in cup hunting, but the Kennel Club hierarchy did, and so a few syncophants were rounded up, and the thing was done. In 1999 The Kennel Club changed the name of the dog to the "Parson Russell Terrier" -– another name invented wholecloth and without historical roots. The American Kennel Club followed the U.K. Kennel Club in embracing both the 12-15 inch standard and in embracing the various invented names and name changes. In 2005, The Kennel Club added a bit more confusion to the story by changing the standard for the dog they were now calling the Parson Russell Terrier, extending it to encompass dogs ranging from 10 to 15 inches tall at the shoulders. The American Kennel Club, however, has not followed the U.K Kennel Club in changing the standard, instead chosing to simply create another breed of dog (now in its Foundation Stock Service) called the "Russell Terrier." The breed description of this dog claims it "originated" in the United Kingdom, but that it was "developed" in Australia -- a country which John Russell never so much as visited, which had no Jack Russells at all until the very late 1960s, and where the dog in question remains a pet and show dog that never sees a moment's work! How to sort it all out, then? I think simplicity is best. In my opinion, there are only two types of terriers in the world: those that work and those that don't. The white ones that work, and which come from a long line of workers, are called Jack Russell Terriers, and they are called that out of respect for the working standard that the Reverend John Russell himself honored throughout his life. What are we to make of the Kennel Club dogs? Simple: They are not Jack Russell terriers. They are not Jack Russells in name, nor are they Jack Russell terriers in terms of performing regular honest work. They are simply another small terrier, same as so many in the Kennel Club. There is nothing wrong with that, but there is nothing very special either. The good news is that with the name changes, no one will ever confuse these Kennel Club pretenders with the real thing – the real Jack Russell Terrier. Is there a larger lesson to be gleaned from this history? Indeed, I think there is, and it is this: No breed of working dog has ever been made in the show ring, while every working breed pulled on to the Kennel Club’s roles has been wecked or divided. This, I think, is history with a warning!.. Exactly the point I tried to make with the stupid woman with the equally stupid Wirehaired Fox Terrier I had the run in with down at the park. She started off asking me why my dog's (Abbott) tail wasn't docked, then asked why I wouldn't register them as PRT (Hello, Rescue, no papers at all!) and ended with Miz Bridget trying to kill the little bugger who was screaming at the end of his leash. (Okay, maybe he wasn't that stupid). That poor little WHT probably couldn't have caught a rabbit in a back yard much less defend himself against my homicidal maniac. Oye, I'd rather have a Chiweenie than one of those hairy things but no, I can have the Real Jack Russells even if they are recorded and not registered. If I could find her again I'd happily hand her this article but she probably wouldn't understand it. After all, and I quote, "Why wouldn't you want an AKC dog?" "Lady D. Gene Rated"? Lol. Whatever does that mean? Really? You are have no real name? You are afraid to let your true name be known? WHY? The article SPECIFICALLY says that the small standard was not embraced by the AKC. It's ALL club nonsense, as the article makes clear, and WHO calls it what hardly matters, does it? The FCI? FCI is a registry for tiny countries without much influence. The FCI countries are places that did NOT create the Jack Russell and which John Russell never so much as visited (same as Australia). It is one more place for pretenders. Thanks for the great information shared. At least now, I know where the Kennel Club came from.